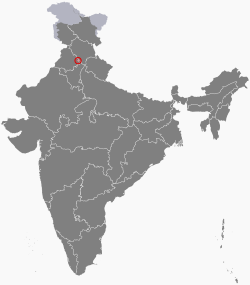 ††under Section 4 of the Punjab Reorganisation Act, 1966（英语：Punjab Reorganisation Act, 1966）. ^ 1.0 1.1 1.2 BJP’s Asha is city Mayor. The Tribune (Chandigarh)（英语：The Tribune (Chandigarh)）. Tribune News Service. 12 January 2017 [25 January 2017]. （原始内容存档于25 January 2017）. ^ Provisional Population Totals, Census of India 2011; Urban Agglomerations/Cities having population 1 lakh and above (PDF). Office of the Registrar General & Census Commissioner, India. [26 March 2012].